We paused on the rough track, seeing the grey veil in front of us suddenly parted, as the strengthening wind finally enabled is to have a brief glimpse of the rocky dome of Eagle Mountain ahead, before swishing shut again, and returning us back into the gloom. We made our way onwards up towards its summit, and lunch. 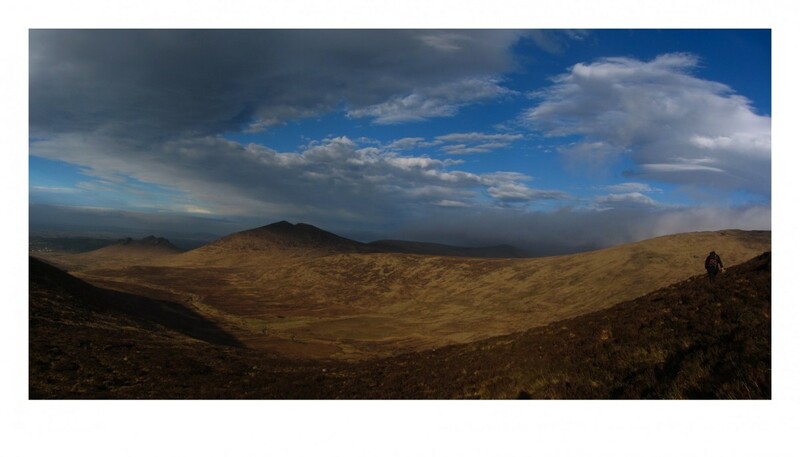 Our walk today was a circular route in the Western Mournes, taking in a couple of summits on the way. 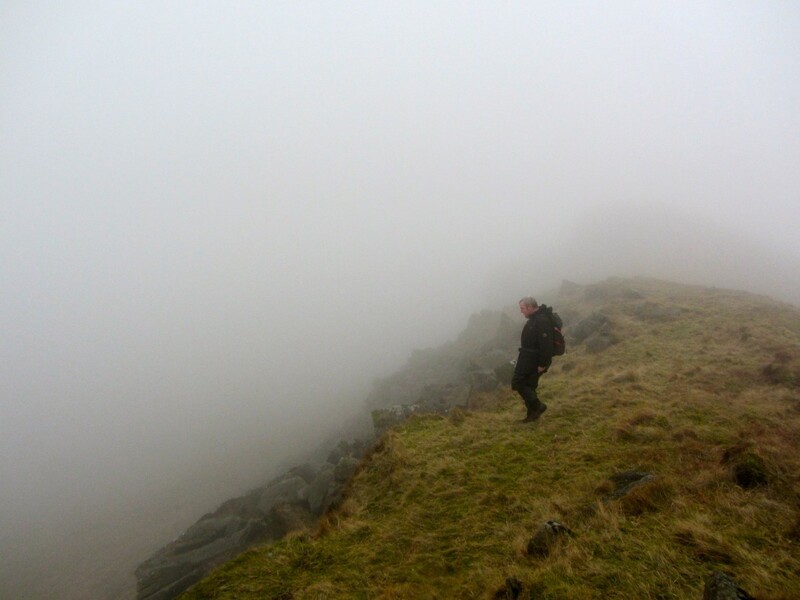 We had parked below Pigeon, and the first part of our walk took us down the foggy Moyad Road. Visibility was very poor, and we kept our ears open for oncoming cars, as we could hear them before we saw them appearing out of the thick fog that was enveloping the road and it’s surroundings. 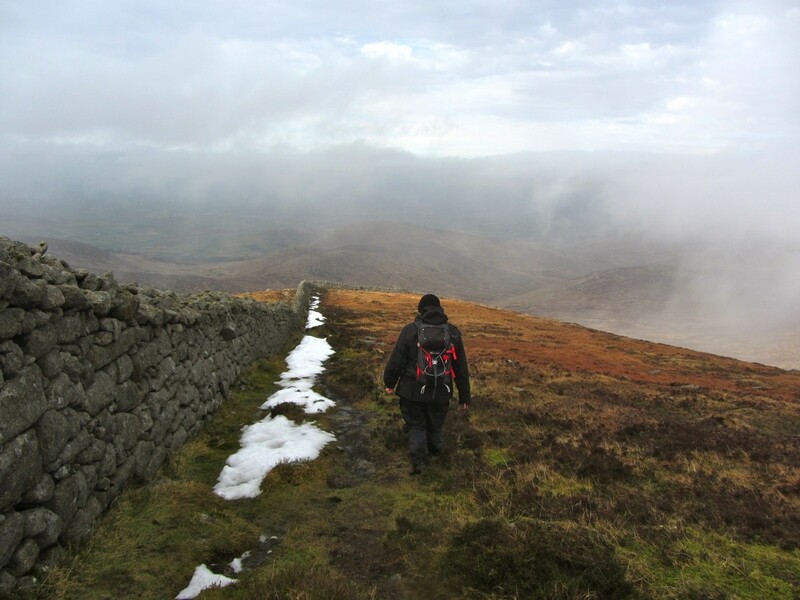 Soon we were off the road, and making our way up the ridgeline of little Slievemageogh, surely one of the easiest mountains in the range, with a gentle ascent up a well trodden (if slightly soggy in places) track, winding up to the summit at all of 316 metres. It may be far from the biggest of mountains, but it has a massive view, and is well worth a visit on it’s own. We paused on the summit to take in some of the views, and we began to see ragged streaks of blue sky slashing through the thick grey cloud cover, light flooding into the valley below, instantly sharpening the view below, a green Oasis amongst the claggy grey murk of the morning. Ahead of us in the distance, the tree covered mounds of Knockchree drew the eye, beyond it Carlingford Lough glittering in the winter sunshine. 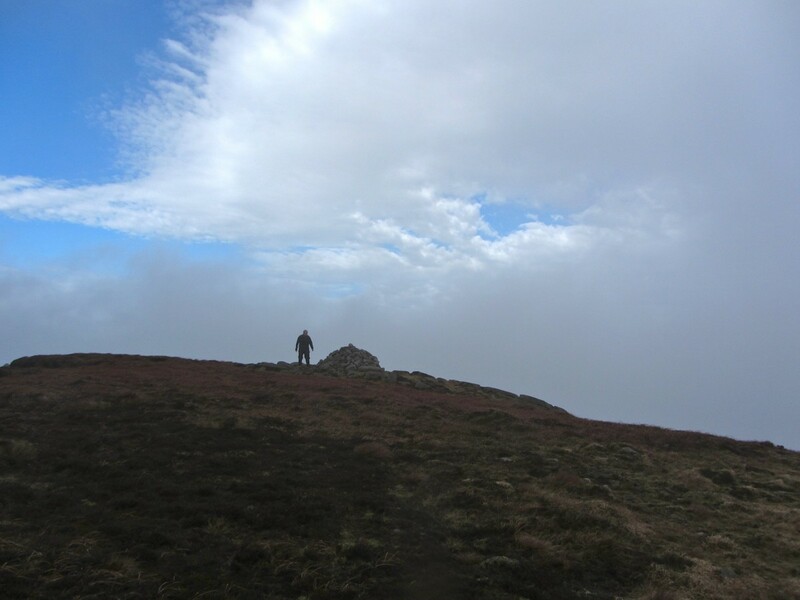 The summit of Slievenageogh has some interesting rock formations, but we didn’t linger amongst them today, and on we went. Making our followed an easy enough trail down along a wall, punctuated by the odd bit of boggy ground, we soon found ourselves at the Windy Gap River, or the Pigeon Rock river, whichever you prefer, for it goes by both names. We followed the river for a while, before crossing at a ford, and making our way up a rough but reasonable track (not on the map) above Eagles soaring cliffs. The cloud had closed in again, and the visibility was varying as the biting wind whipped it across the mountains. Tantalising glimpses of the view down into the valley below and onwards were revealed to us, before the grey mass closed in once more. We passed 2 walkers descending, a raised hand all the greeting we could manage in the howling wind. Reaching the summit cairn of Eagle, we took shelter behind the wall for a spot of lunch. A large swathe of snow, sheltered from the Sun behind the wall, stubbornly clung to the ground, unwilling to submit to the recent thaw. Even with the shelter of the wall, the howling wind bombarding the summit soon dropped the body temperature, so after a quick refuelling, we headed on. We had barely left, when the black shape of a large Raven effortlessly glided in, hoping to pick up any morsels left behind. It must have been watching us in the gloom, waiting for us to leave! We had left no trace of anything, and it loudly croaked its disapproval at missing out. Winding our way down the steep rock strewn slope of Eagle, we found ourselves at the Windy Gap, which was actually relatively sheltered given the wind direction. 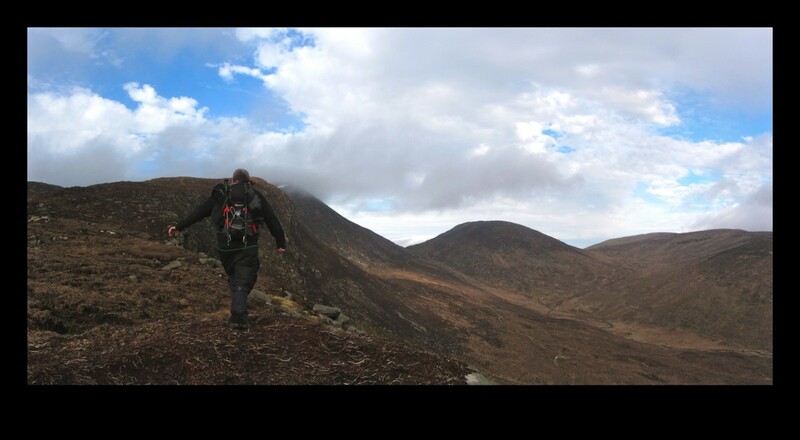 We contoured around Slievemoughanmore, taking the chance to explore new areas, before our last ascent of the day, Pigeon. Following the jagged stone wall, thousands of small rocks expertly linked together, hugging and following every contour, like scales of a giant stone serpent. In places the wall was bowed and battered, the result of many years of battling against the elements, yet remained standing, testament to the skill of its builders. We soon found ourselves descending towards the car, some new ground covered, and our mountain cravings satiated for another while.